The Ware for February 2010 is shown below. Click on the photo for a much larger version. This is yet another mobile phone PCB blank of unknown origin. 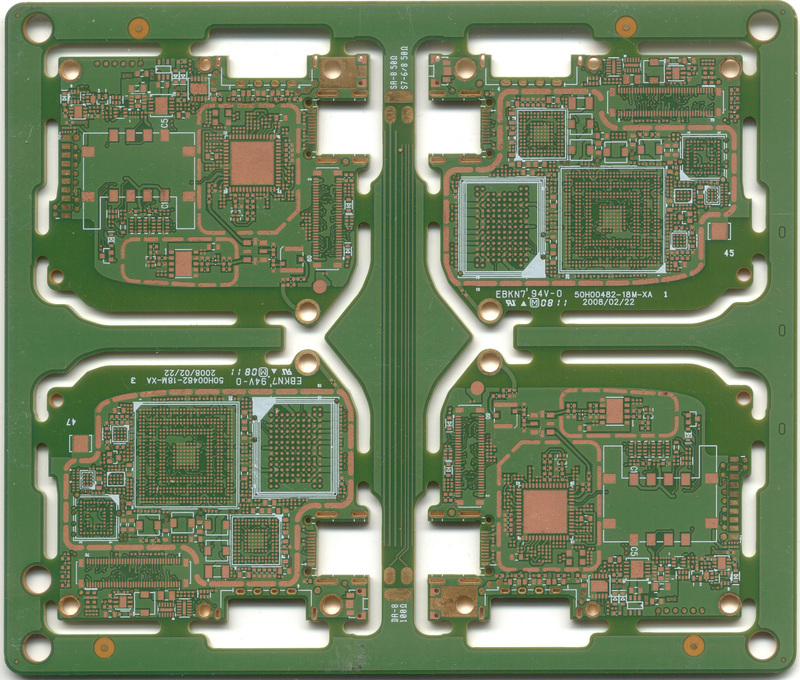 It’s nice that the layout of the PCB tiling reveals both the top and bottom sides in the same panel, and it’s interesting to note the impedance test coupons going down the center spine. Like the previous mobile phone PCBs featured on Name that Ware, I suspect this is from an HTC design, but that’s about all I know about it. Curious to find out what product this is from, I’m betting someone out there will know! This entry was posted on Tuesday, February 16th, 2010 at 3:33 am and is filed under Hacking. You can follow any responses to this entry through the RSS 2.0 feed. Both comments and pings are currently closed. My guess is it’s from a Blackberry. There appears to be a SIM card outline as well. That’s my best guess. It is definitely an HTC phone. And has roughly the same components. Anyone able to find the exact model? There’s a Matsushita Panasonic logo on the board, I’m guessing Matsushita manufactured the PCB. Interestingly enough there’s no keypad on the PCB. It’s probably GSM/UMTS/WCDMA, since there’s a sim card slot. Going by Wikipedia dimensions of sim cards, dimensions of the PCB are roughly 48x40mm. 4cm seems pretty small for a touch-screen phone, so I’m guessing it’s a slider. PCB looks to be dated early February 2008, EBKN7 model number indicates a Panasonic ALIVH-G pcb substrate, which as far as I can tell was first released some time around 2002 (not particularly helpful, but interesting nonetheless). I can’t see an extUSB port (dual-sided 11-pin accessory port used in many HTC phones) anywhere, so if this is indeed a HTC design, chances it’s a pre-2007 design (most 2007 and newer models I’ve look at have had extUSB ports). There’s no SD-card slot on this board either, as far as I can see, and it seems unlikely that they’d put it on a different board to the sim card and chipset (I assume this is the mainboard, as it as a bunch of BGA packages on it). It could be an early HTC Touch Diamond, but the board seems a bit small (actually, it looks a bit small for HTC in general, I was under the impression their boards were usually about the same size as the casing itself). Looking at the HTC Touch Pro board, it seems that the extUSB isn’t always connected to the motherboard, so it’s quite possibly not that old. 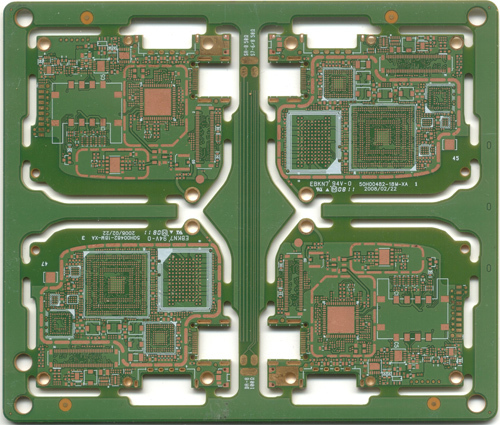 My impression that HTC boards were full-case affairs was incorrect, further examination shows a few boards which were about the same size as this, with seperate PCBs for cameras and keyboards. The FCC submission for the Touch Diamond disproves my guess; but a Touch or similar vintage HTC of some kind does look likely. I’m thinking it’s a Touch HD. Pretty sure HTC names the board revisions sequentially and the Touch Pro is 00480. This one is marked 00482 which would be a likely be a later release. The USB port fits into the square cut-out on the bottom edge of the PCB — you can see the 11 landing pads for the pins. Also, the D-Pad has a cut-out in the middle of most HTC boards meaning that this particular board doesn’t have one. In that it’s also GSM, that pretty much narrows it down to the Touch HD unless they OEM’d something under a carrier’s brand. The vias do not line up between the boards. This means that they are making blind via boards (where a via only goes between one outer layer and the next inner layer instead of all the way through to the other outer layer) – an expensive process versus the traditional via method, or the boards in quadrants 1 and 3 are not the same, flipped boards in quadrants 2 and 4. It also appears the vias are just flashes and do not have holes drilled/lasered in them, possibly the reason it wound up in the reject pile (why they did not catch it prior to solder mask and silkscreen processes, I don’t know). The board uses via in pad with plugged vias. Blind vias are common in mobile devices. This board is from an HTC Touch Dual. Check out step 6 & 7. you can see the curved shields and components lining up as well as the board outline. Interesting how this board differs from the other HTC boards. Yeah, it looks much more like a RIM design than anything else I’ve seen from HTC. Nice job IDing it. There is one dead giveaway though that this isn’t a RIM device though. The EXTUSB connector. Not so much because it is EXTUSB, but because it isn’t mini- or micro- USB, based on the pin count. The other thing is that it is positioned low on the device, but on the left. All RIM devices are all either high and on the left or low and on the right. By designing the assembly array in this manner, with two boards showing the top side and two boards showing the bottom side, the assembler will only have to tool a single solder stencil that works for both sides of the array. I don’t know why a Blackberry has been proposed by two people. It’s most definitely not a RIM: All their recent boards are made by AT&S and have their logo on it. They use a blue soldermask on everything since the Bold in 2008. All full-width RIM phones before the 8900 have a single mostly one sided PCB with the keyboard and display on the back. Any RIM phone since the 8800 have GPS and Bluetooth, in their own shields. RIMs are always quad band or since 08 CDMA+GSM. There’s far too few RF components for that. And RIM doesn’t manufacture in Asia, as far as I know. They’re in Eastern Europe, Canada and Mexico. Good post! I ‘ve found something like this time to time. Thank you. 1 day old TP2 and getting some adjustment shock. I will look completely thru this internet site, nevertheless it is so diverse from my q and my palm 800 which were both largely the same. Right now the only thing I actually understand is tips on how to access world wide web ( that is why I bought it ) Creating calls recieving messages is tougher, moving pictures to TP@ so I can use it being a viewer appears extremely hard. I can move them but i want them to become quickly uncovered within the device. Finding out curve I hope is all.